Apprentice carpenters Robert Henry (left) and Geoffrey Johns remove shutters from the Chiefswood home of poet E. Pauline Johnson on Highway 54 in Ohsweken. 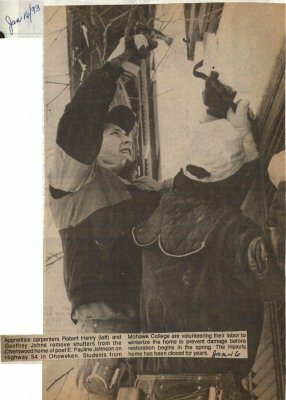 Students from Mohawk College are volunteering their labor to winterize the home to prevent damage before restoration begins in the spring. The historic home has been closed for years. Henry, Robert ; Johns, Geoffrey. Chiefswood Museum ; Mohawk College.